tibet2 -- Our first day of trekking was quite short (3 hours) and easy, shorter in fact than we had planned. According to the Moon publication, Tibet Handbook, (our Bible) we should have walked farther to help acclimate to the altitude and to make day 2 easier. But our porters had other plans. Communication was almost impossible because we had no common language but we finally determined that one of our porters wanted to go to a village (Cholam I think) where she would send us a different porter. That porter would meet us in the morning the next day. This was an unexpected development and we were not sure what to think but sure enough, early the next morning a new porter showed up and things went smoothly after that. This picture was taken from out camp site (4250m) the first day. 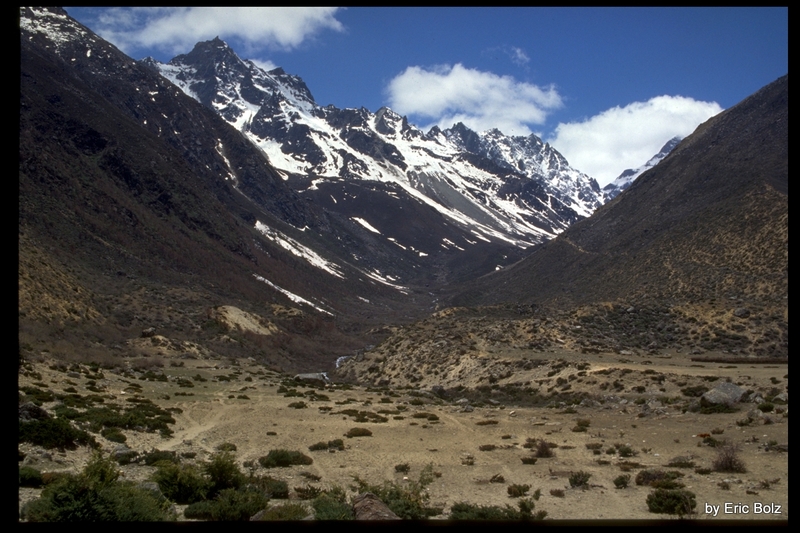 Up this valley is the Langma La (Pass) at 5350 meters, a difficult one day hike from this location. You can just see a bit of the trail as it winds up the valley on the right.